Supports WinCC Flexible 2005 and 2008 Archives and TIA Portal. 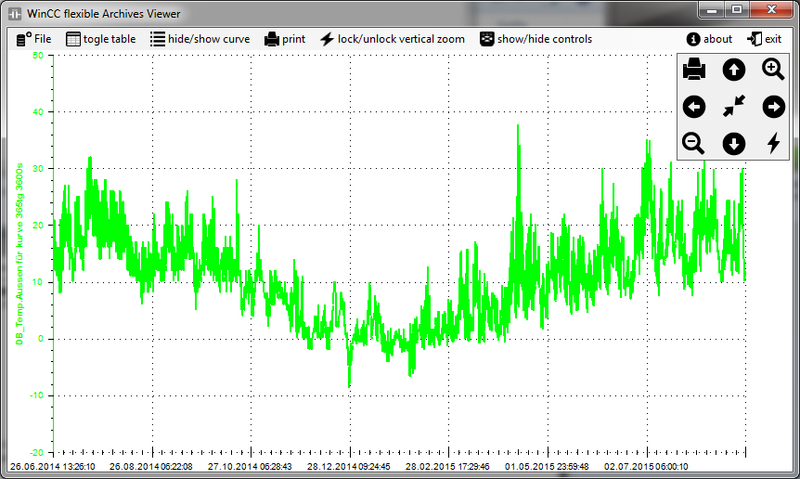 Simple way to analyze logged data of WinCC flexible or TIA Portal, you can print completly trend or only a part of it. Very simple integration in HMI (command argumetnts like open automaticly a file ot open program in fullscreen mode), absolutely for free. 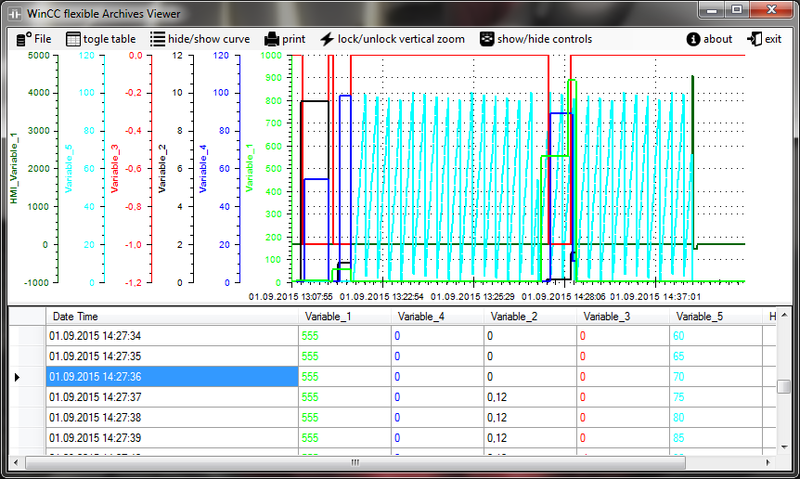 Simple data view in table mode , sorted by record line and colleted of all channels in one row. Optimized for touch interface, you can use WinCC flexible and TIA Portal Archive Viewer without mouse right button, zoom in, zoom out, pan left, pan right, pan top, pan bottom. WinCC flexible and TIA Portal Archive Viewer suüports only CSV Files with no loop archivment method. 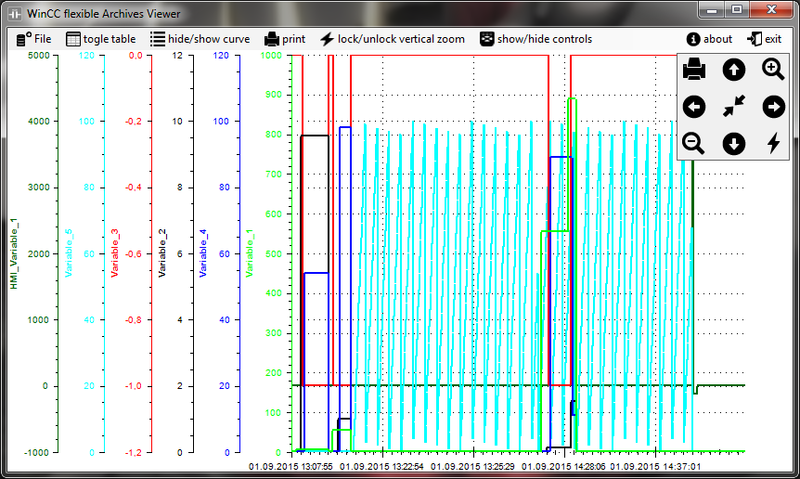 Can I use this archive viewer for S7 1200PLC’s datalogging(without HMI panel)? The datalogging file from CPU is a *.CSV file. I tried to import into archive viewer but it is not possible? at this moment it is not possible to view archive from S7-1200/1300/1500. But if you upload your file to dropbox (or whatever) and sends me link to this file, I can take a loock for it. I think it will be possible to implement this feature, or i can create a new version of viewer, axactly for TIA-S7 archives. Can I take print of table view?? If i want to move any column Left or right in table, how to do?? Hello, PLC2K I’m from Bulgaria and I’m a technologist at pharmaceutical factory. Our owners installed new automatic filming of tablets with touch panel HMI program WinCC Version 2. We observe and record seven indicators. They are generated in csv files: logAlarms, logAudit and logProcess. 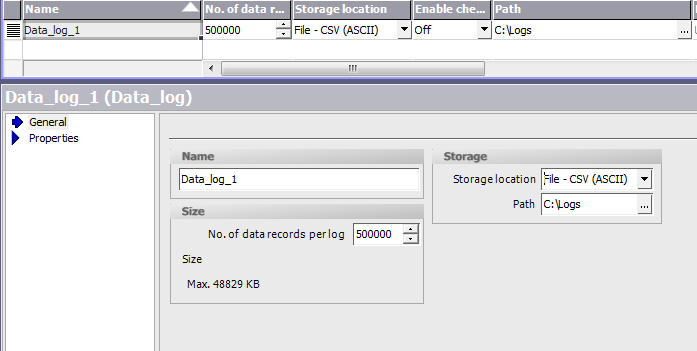 Your version of the reader recognizes only logProcess.csv, but does not understand logAlarms and logAudit files. Is it possible to make a version that can read these files. please describe me, how do you see the auditTrail view? It’s not more a chart, so only a list of actions. The same is with the Alarm history. gibt es auch die Möglichkeit mehrere Archive gleichzeitig zu öffnen? 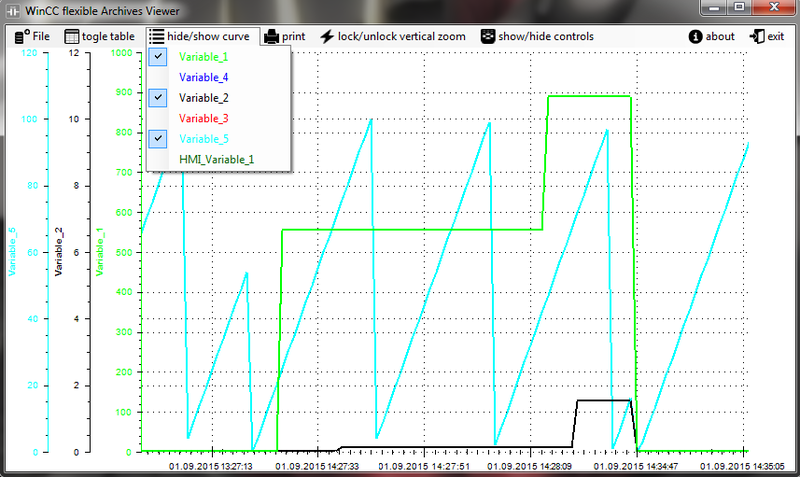 Very nice program, it gives me a quick overview of my process log. Is it possible to adjust the axis scale? I am recording abstraction setpoint and actual abstraction (from a river), but the axis scales are different, making it difficult to identify whether over abstraction has occured. Hello, this is Bernd from munich. I do programming S7 and TIA Application. In my free time, I do try program in C#. Maybe it is possible to send me the sources of your program WinCC flexible Archive Viewer. I want to learn, how to do.. and I would be very happy to get the sources. Исходники не планируете открыть на Git? Набрался наглости и немного продолжил Ваш проект. Если Вы не против (либо недоступны), то выложу в паблик -на плцфорум и на Гитхаб. Hello, can you share a link to git? Hi is it possible to open more then one Archiv file? Hello, this version doesn’t support this feature. can you please include date and time sorting and print option for the table view, in the next version.